Uncompressed file was 147 Mb. This file could only be uploaded in compressed .jpg format (what about losslessly compressed PNG? ), which prevents further work and improvement. This is a proposal for a Wikimedia wiki dedicated to the restoration of old or damaged images. The suggested url is restoration.wikimedia.org, and the project will expand on an initiative that currently runs on Commons, but which is believed to not be entirely sufficient. A picture paints a thousand words and for this reason, we are quite happy that Commons delivers pictures to all our projects. Because of Commons we have one copy and, we only need to check copyright once. Of special importance are the images that predate ubiquitous digital photography. The paintings, the etches, the gravures, the kodachromes show a world that is gone. Many of these images are damaged and need restoration. We are fortunate having a growing group of people who restore images from different times, different places created by different techniques. Restoration takes not only considerable skill and dedication it also takes a keen eye to assess the relevance of material. This project is to grow the restoration community and to provide the people who restore with the resources that they need. The best source material exceeds 100MB in uncompressed format. Therefore, actual working copies cannot be uploaded to Commons. The volunteers who do this work lack the basis for wiki collaboration: the ability to freely improve upon each other's efforts. Currently they are forced to non-WMF environments to trade files privately, without any independent archive. So valuable material that takes days, weeks, or months to develop may be lost if particular volunteers fall by the wayside. A wiki for encyclopedic image restoration would benefit all language versions of Wikipedia. Currently, restorationists are working on material of global scope. It is easier to translate a caption than a full article. So once a high quality image becomes available it can illustrate articles in many languages. With a project dedicated to the restoration of scanned original material, we aim to reach out to all the archives in the world. We want to acknowledge their important task that is the conservation of their important material. By working on the restoration of their material and giving back the restored material. By working hard to achieve the featured status for our restoration work, we not only fulfill our own objectives but also give their material a relevant platform. The standard for any digital restoration is that it must be possible to repeat them and improve on them. This is only possible when the original material is saved in an uncompressed format. 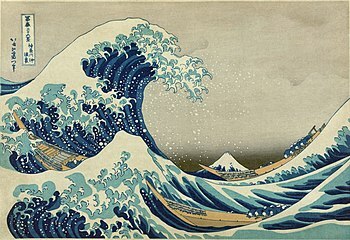 The size of these files can be really large, the great wave of Kanagawa is with its 147 Mb not among the biggest, files of over 500 Mb are not that rare. When the files are available on a dedicated project, the restrictions can be lifted for the people that restore. It is obvious that all this effort will result in properly sized images on Commons. By providing a project that is dedicated to restorations, we will grow a community of people dedicated to quality illustrations. They already have a big impact on the quality of illustrations of our projects, but when some tender love and care, this will become even better. Please dont just count the numbers of supporters and opposers. read the ideas too. thanks. I support the idea to do this kind of work in wikimedia -- however I propose to do it on wikisource or commons. The technical problems need some attention though. The images that will be in the restoration.wikimedia.org will not be the images that we want to share with projects. The end result ends up in Commons and it for dissemination. The project would benefit people who restore because it gives them a place of concentrated attention. It will also help us in reaching out to archives and museums. When Commons has the same need for features that specifically benefit restorations, obviously have such features installed on Commons as well. In the mean time, the size of Commons is quite different. The restoration project is a niche project and consequently scalability is not our first concern. Oppose This is a project for Commons. after reading your proposal I can see you will need two things to be made in order to do this on commons. Create a 'bigupload' right with a big size limit (2GB for example). -> pretty easy to implement. Create a 'restricteduploads' right which gives the user the ability to upload tiff (and other needed formats) files. -> also easy to implement. I don't see any scaling problems, unless you're using that word to mean something different than scaling. The main problem here is the upload limit. The solution to that isn't a new wiki. What we want (and not just for restoration!) is a better upload system. In the interim, a bigupload is a reasonable workaround. Equally, thumbnailing large PNGs or TIFFs isn't solved by opening a new wiki (see comments on bug 17714). This page was last edited on 30 May 2011, at 04:16.